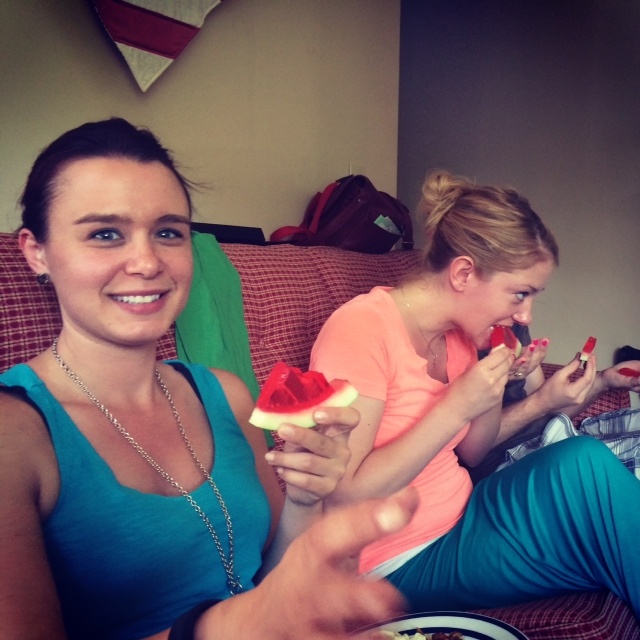 BBQ time means watermelon. But when the majority of those attending are adults, well, it just makes sense to make Jello shots. However, those little cups get messy and then there is all the trash that comes with it, so we found another way to make Jello shots without all the plastic trash and to make it look cute. Plus, it wasn’t that much work! Just a lot of gelatin. Katie will probably kill be for the above picture, but to be fair, she knew a picture was about to be taken. Just proof that we did, in fact, eat them, and I will say they were delicious!! The below picture is just to give you a sense of how we filled the melons (you’ll need that for later when you look at the recipe.) So clear out the fridge and make some! We’ve been talking about doing this to all kinds of fruit for a Jello shot “fruit platter” with lemons, limes, oranges, and strawberries. How fun would that be?! With a large knife, carefully split the watermelon in half, lengthwise. It will now be in two halves. Scoop out the fruit, leaving the rind and less than a 1/4 inch of fruit. Set fruit aside for snacking later. Place watermelon rind in a glass baking dish with sides. It will act as a bowl for the Jello shots. Keep it in place with paper towels, so it won’t tip. Bring 4 cups of water to a boil. Add gelatin and watermelon Jello to a large bowl. Add boiling water and whisk until gelatin is dissolved. Add 4 cups of vodka and stir until combined. Pour mixture into one half of the watermelon until it is filled to the top. If using a large watermelon, you may only need one half. If a small watermelon, you might use both halves. Place is refrigerator and chill for at least 4 hours or until gelatin is hardened. Once hardened, remove from fridge and slice into 1-inch pieces. You can cut them once again so they look like wedges. Refrigerate until the party.